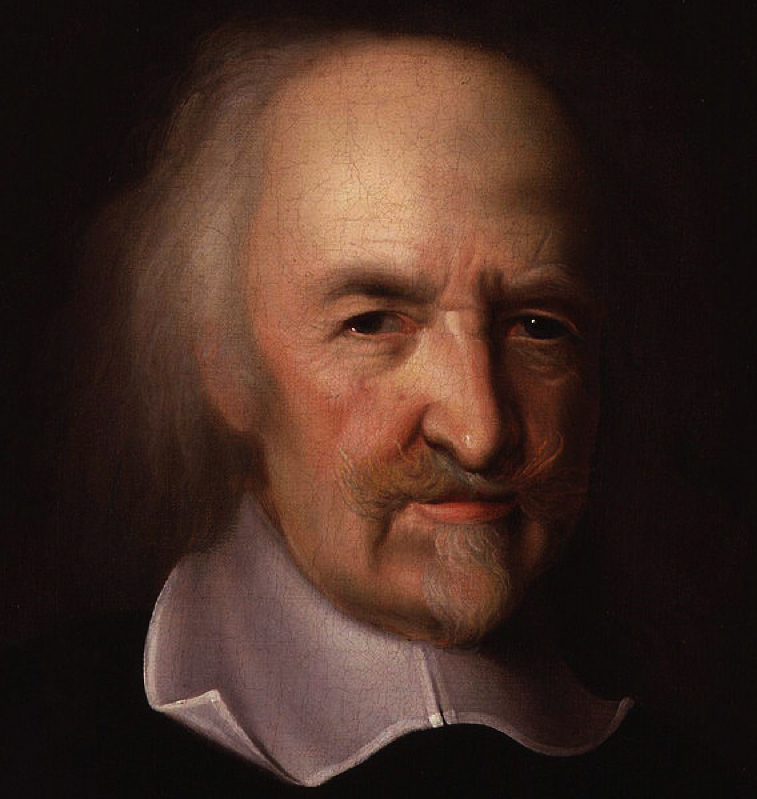 Recognised as 'the second great English philosopher of the seventeenth century,' Thomas Hobbes (1588-1679) was one of Francis Bacon's pupils, and was to become an influence to John Locke. After his education at Oxford, he tutored and acted as secretary to certain noblemen including members of the Cavendish family, as well as Bacon himself. During the civil wars, being more or less a royalist, he lived in exile in Paris (1640-1651) where he wrote and had certain works published such as Leviathan. He planned on three books. The first on 'physical bodies,' the second on 'human nature' and the third on 'state'. He wrote them in English and Latin, but the two versions differ considerably. The best known of this work was Leviathan, (published in Paris, 1651) but also according to the Norton Anthology, it 'does not fit into the scheme at all'. Leviathan caused a scandal both with the Puritans and the royalists. It's categoric sectarianism disturbed the former, and as Hobbes seemed to give equal standing and legitimacy to both the usurper and the legal monarch, this infuriated the latter. On his return to England Hobbes was forgiven by Cromwell. He even went unpunished for his royalist 'treason' after the Restoration, much to the anger of many royalists. No doubt this enhanced his reputation and incited his 'followers' who called themselves 'Hobbists'. The majority of them had no philosophical or intellectual calling, therefore no academical reason to justify this disciple tendency. It was simply because the name 'Hobbes' evoked scandal. Here is a short excerpt from Leviathan. Chapter 13, of THE NATURAL CONDITION OF MANKIND AS CONCERNING THEIR FELICITY AND MISERY. Nature hath made men so equal in the faculties of body and mind as that, though there be found one man sometimes manifestly stronger in body or of quicker mind than another, yet when all is reckoned together, the difference between man and man is not so considerable as that one man can thereupon claim to himself any benefit, to which another may not pretend as well as he. For as to the strength of body, the weakest has strength enough to kill the stongest, either by secret machination, or by confederacy with others that are in the same danger with himself. And as to the faculties of the mind- setting aside the arts grounded upon words, and especially that skill of proceeding upon general and infallible rules, called science; which very few have, and but in few things; as being not a native faculty, born with us; nor attained, as prudence, while we look after somewhat else- I find yet a greater equality amongst men than that of strength. For prudence is but experience, which equal time equally bestows on all men, in those things they equally apply themselves unto. That which may perhaps make such equality incredible is but vain conceit of one's own wisdom, which almost all men think they have in a greater degree than the vulgar- that is, than all men but themselves and a few others, whom by fame, or for concurring with themselves, they approve. For such is the nature of men, that howsoever they may acknowledge many others to be more witty, or more eloquent, or more learned, yet they will hardly believe there be many so wise as themselves; for they see their own wit at hand, and other men's at a distance. But this proveth rather that men are in that point equal, than unequal. For there is not ordinarily a greater sign of the equal distribution of anything than that every man is contented with his share. One can agree with Hobbes certainly regarding the intransigent constancy of human nature. But his affirmation that nature makes men equal in all other respects is, to my mind untenable, and surely this is just as well. That human nature never changes is historically evident. Equality could thus be applied only to human nature as such. The only evolution that takes place is the need of human nature to adapt to change and to man's technological and scientific achievements which determine progress. Such adaptation however, is realised through habit and necessity, until it eventually becomes inherent. A natural inborn capacity of future generations. As an obvious example, man was terribly, naively unaccustomed to the enormous potential of heavy artillery and automatic weapons used in The Great War. After too many thousands of young soldiers were needlessly slaughtered, it was eventually grasped that absurd, medieval military tactics should be changed. Or, for a far less tragic example, whereas one first had to read in order to master the basics of using early (Mac) computers, (and in those days detailed manuals were considered a necessary part of the package) one's children never needed to read anything at all to use a computer. Such 'knowledge' was virtually inborn from their generation onwards, in ever increasing extents. But this adaptation, which can be considered also as part of survival, implying all forms, including professional survival, has no influence on human nature itself. Many great writers including Chaucer, Shakespeare and Molière, etc., are figureheads of its portrayal. They are the timeless illustrators and caricaturists of human nature, of its strengths and weaknesses, its grandeur and pettiness. The timelessness of the works of these individual giants reflect the timelessness of human nature itself, that man will always be able to identify with, throughout centuries of civilisation, and for as long as humanity exists. This however, is the only equality of humanity, for it's a fallacy to believe than man is born equal. The idea of physical or genetical, therefore mental and characteristic equality is an artifice, simply because it's not naturally possible. Natural conditions and individual circumstances cannot possibly determine equality. Man's positive evolution cannot depend on a condition of equality. If equality were an attainable, obligatory criterion, there would be no positive evolution. It would only engender mediocrity. Obviously this doesn't mean that we shouldn't apply the rules of justice with absolute equity, or that we should refrain from the principle of trying to give our children 'equal' chances and opportunities, to benefit as well as possible from the best education available, at least that within one's means and the intellectual reach of one's children. But obviously one should never use 'double standards' in justice and politics. And one should never even dream of lowering the level of national education in what would be a vain and senseless attempt to bring about mythic equality. In the latter case it means that if one aspires to reach the stars, and strives to attain the knowledge and capacity to do so, to discourage or block such an individual from reaching this goal would virtually be criminal. Those who for the sake of an ideology, try to restrict the creator, or block the scientist, the mathematician, the artist, from reaching his or her zenith, and thus from adding that precious, individual contribution, that master-piece for the glory of mankind, progress, survival and posterity, are no better than brain-washed fanatics. Those devoid of reason, intelligence, talent, and sensitivity, who, for the cause of blind ideology, callously destroy the creations of others; the monuments of history, the roots of their own paltry existence, to replace them with nothing other than dogma, lies, mediocrity, dust and death. Isn't this conclusive enough of the fallacy of equality as an ideal or natural attribute?